KIF tests run in the simulator and are built to a different target, so using private API’s isn’t a problem (KIF wouldn’t work unless it used a ton of private API’s). Jim Puls from Square (the makers of KIF) was helpful enough to chime in this thread to share how they do it at Square: by method swizzling the crap out of the CLLocationManager class, replacing startUpdatingLocation, location, and locationServicesEnabled with their own versions so the user location mechanics would be wholesale replaced, thus getting around the permission alert box. We followed their advice and ended up mocking out CLLocationManager (see how in this gist) and it worked well enough, but I was unsatisfied that we had to mock out the entire location machinery just to get rid of that permissions alert box. It wasn’t elegant code. I decided to keep searching for a more elegant solution and I started at what I thought was the most obvious place: UIAlertView. If I could find the code where the offending UIAlertView is actually created then I would know which code to mock out and hopefully bypass permissions. To do this, I could have swizzled some UIAlertView init methods or added a symbolic breakpoint in Xcode, but I had recently come across Mark Dalymple’s excellent three part series on DTrace (1, 2, and 3), and this seemed like a good opportunity to use it for a worthy real-world problem. I created a new blank iOS 6.0 project with a single MKMapView that wants to show the current user location (you can ⬇download the project here). I built and ran the app for the simulator to verify that it brought up the alert box and to create a binary that I would later use in Instruments as a target for a custom DTrace instrument. Now it’s a little easier to see what’s going on. It looks like [UIWindow keyWindow] calls private class method +_alertWindow on UIAlertView. The stack trace of the _alertWindow calls are all the same, and lead to a dead end. They don’t seem to be related to location at all but instead are triggered on normal app startup routines. The only other hit we got, +_initializeSafeCategory, is related to Accessibility and not location. Well, not exactly. Using DTrace I was able to eliminate the possibility that the UIAlertView was created inside the TestingCurrentLocation process, which means it has to be created in another process. So I knew that somehow, my TestingCurrentLocation process was communicating with another outside process which was responsible for location permissions. 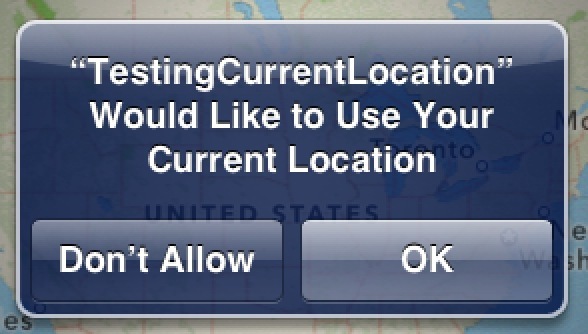 Apple doesn’t want to give app developers the chance of getting around the location permissions box for privacy reasons, so they would want to lock it down in another process. This gave me a new process to probe for information. But what should I look for? I knew that if a user allowed an app in the simulator to get their location, they wouldn’t be asked again even if the simulator was restarted (only by resetting the simulator would the location permissions alert box come up again). So I knew that there had to be somewhere on the filesystem where locationd was storing the permission authorizations for simulator apps. If I could find this file (most likely a preferences file), I could possibly inject authorization for an app before it ever ran, thus never displaying the alert box even on the apps first run in the simulator. This script will trace all system calls to open* (* is a wildcard), but only on processes with the name “locationd” (the /execname == "locationd"/ line defines a predicate for the probe). The code between the curly-braces is the action to perform on each match. Inside the curly-braces we are printing the first argument to open, which is the path of the file (to find out which arguments a system call takes, use man 2 syscall which in this case would be man 2 open). We have to use copyinstr to copy data from the process into the kernel’s address space (where DTrace runs). Here we are tracing all calls to write* and printing out the path name using the first argument (arg0) which is a file descriptor (for more on using file descriptors in DTrace, read this tutorial). We are also printing out the second argument (arg1) which is a buffer of the contents written to the file. Now if we run the script just before we confirm we want to allow this app to use our current location, we will know where locationd is writing to save this information. Property List’s (.plist) are a strange format but not impossible to read. The real important bit seemed to be the Authorized key which was set to <true/>. I tried changing that to <false/> and rerunning the app in the simulator and my app no longer had access to location information and also didn’t bring up the location permission alert box. If I removed the entire <dict></dict> block representing my app, the location permission alert box would show back up the next time I ran the app in the simulator. The code above runs before the app is launched in the simulator, and it works perfectly. We were able to get rid of the nasty CLLocationManager mocking and I was finally able to move on to something more productive. But trying to solve this problem did lead me to learn a lot more about DTrace. Before, DTrace just seemed like this magical thing used by superhero programmers. Now that I’ve used it so solve a real problem, it’s not so magical anymore, and I am already starting to think of other problems I could solve using it that I wouldn’t have been able to before. I hope that by writing about how I used DTrace to solve this problem, it will lead you to try it out the next time you are stuck on something similar. If you do, please let me know how you did by getting in touch with me on my twitter.